This last week was probably one of the most productive in a while. People always go to New York and they go to Boston, but for those of you who have never been to North Adams, it is a beautiful town in Massachusetts about three to four hours away from New York and three hours away from Boston. 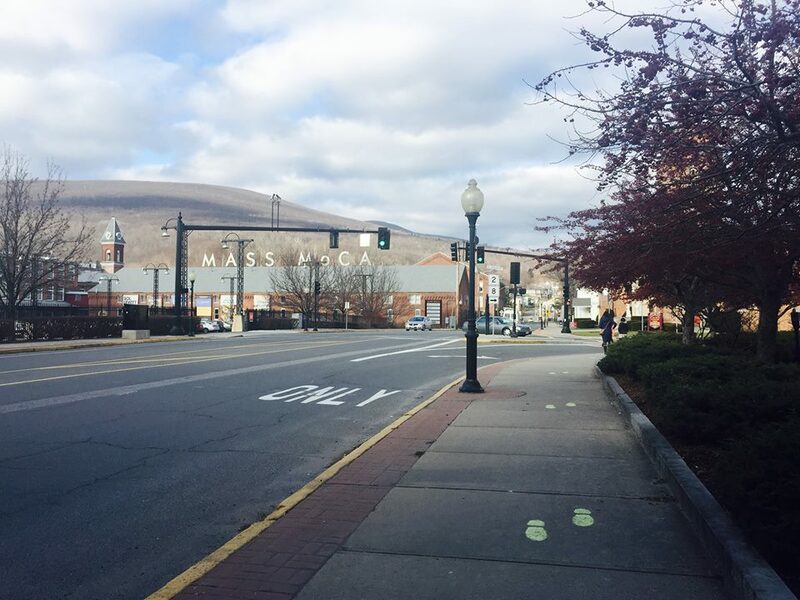 North Adams is a wonderful, artsy little town in the middle of nature. It is pretty surreal. On top of that, it also has one of the largest centers for contemporary visual art and performing arts in the US. I was lucky enough to stay in this amazing place for a week with my mom Gingger Shankar and her friends/creative partners Dave Liang from The Shanghai Restoration Project and Yunfan Sun, an incredible visual artist. They have a multi-media project called Nari which is about my grandmother and great-grandmother that got into MASS MoCa's residency program. I was also lucky enough to play guitar and sing a bit on it, but I will be doing a separate post about Nari very soon. There are so many things about this experience at MASS MoCa that I want to document, but I will only talk about the best things for now because I could go on forever with this. I will talk about the exhibits first. The museum is massive and altogether contains 25 buildings, including some empty buildings and ones still being worked on, but still you can imagine how much astonishing art there was to see through out the museum. There were two exhibits that struck me the most. The first one Encampment by Francesco Clemente. You go into this big room and see these tents placed around the room, and then you go into the tents, each with a different theme and every inside wall covered in paintings. Some racy, some dark, some bright, some bold, some making a statement, and some just to look pretty. One tent had the theme of a man in a top hat and each painting was pretty racy while making a statement. Another tent, the first one I walked into, had a theme about women. That one had some of my favorite paintings in it. Another tent was very bright pink and had many paintings of angels laying, dead it seemed, on tables. l loved the darkness of some of these and his contemporary style of painting. My other favorite exhibit was called Bibliothecaphilia and was basically a library/reading room. It contained books such as classic poetry books with poems written by Shakespeare and Edgar Allen Poe, The Great Gatsby by F. Scott Fitzgerald, books about the act of decision making (which would be useful for someone like me) and books about music. I loved sitting and reading poems such as Helen, Annabel Lee and Israfel, written by Edgar Allen Poe. The last and most important thing I want to talk about is how lovely everybody at MASS MoCa is. Everyone is so friendly and accommodating. I met some really amazing people. The entire tech crew was fantastic and super fun! Everyone who worked in the performing arts department were beyond lovely. One of the girls, Catherine, even lent me a guitar for the week so I could work on songs and practice. She is awesome! Her band just played in NYC and they write super nice music. They are called GRNDMS, you should check them out! I had a great time hanging out with everyone else at MASS MoCa. MASS MoCa was an extraordinary place to focus on writing and workshopping songs. I even did some drawing while I was there. I did a lot of work in Lickety Split, the museums cafe and I practiced constantly in the production office. I am immensely grateful for this past week and for all of the inspiring people I got to meet. I can't wait to go back! Last, but not least, this is Sabine, the cat who lives at Porches, the hotel we stayed in. Isn't she just precious?